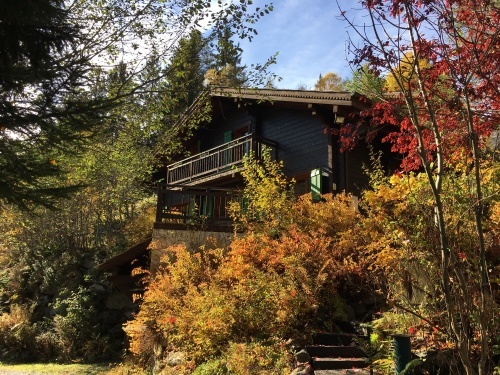 Our luxury chalet; La Cachette is situated in a traditional mountain setting on the south side of the valley with magnificent views of Mont Blanc and the surrounding mountains. 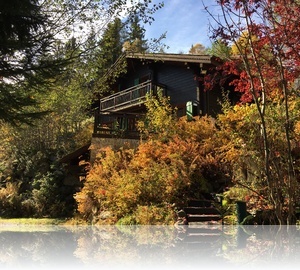 This modern chalet, is south facing and receives sun most of the day through winter and summer. The interior is thoughtful and cosy for your comfort and sleeps up to 10 people. One of the many great features is the large open log fire in the lounge. Clients return to La Cachette year after year and enjoy everything on offer in the Chamonix area. 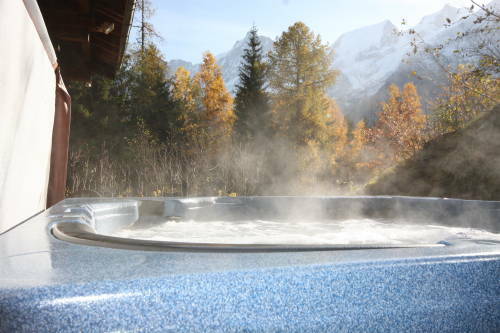 La Cachette boasts a fabulous patio hot tub with the most magnificent views in Chamonix of the Aiguille Du Midi & Mont Blanc Massif to soak your aching muscles after a day on the slopes as well as a wonderful cedar sauna. There are an abundance of forest walks year-round right from the door. 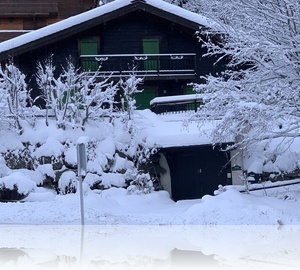 La Cachette offers an ideal location during both the Winter and the Summer seasons for Chamonix accommodation. La Cachette is on the south side of Chamonix in a village called Coupeau. 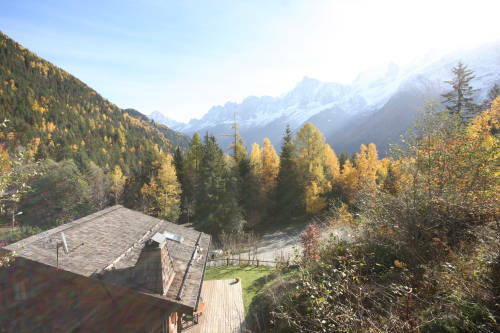 It is by far the most sought after area to live within Chamonix. It’s a five-minute drive to the nearest ski area of Les Houches, a ten-minute drive to the centre of Chamonix and a twenty-minute drive to the Argentiere Ski area of the Grand Montets. Nestled deep in the forest in Coupeau, it is a beautiful location and has easy access to walks, mountain biking, close-by is the Merlet Animal Park and also a fun adventure playground for children and adults alike just across the road. 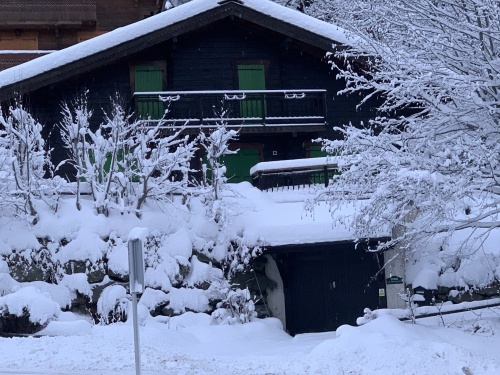 There is good Wi-Fi coverage all over the Chalet including every bedroom and on the patio.You can move between Wi-Fi points throughout the chalets accommodation without having to re log in. We also have a PC, printer and scanner. An open plan kitchen/lounge area is fitted around a large fireplace, which provides a warm, intimate atmosphere for guests. Two large sofas and two armchairs comfortably accommodate eight people. People also like to sit around the beautiful stone fireplace to savour the alpine atmosphere. The lounge includes a cinema system with a large flat screen TV with full satellite channels, a full DVD system together with a 5.1 Bose speaker system which you can attach your Iphone/Ipad to and play your own music.. There is an excellent choice of the latest DVD's. 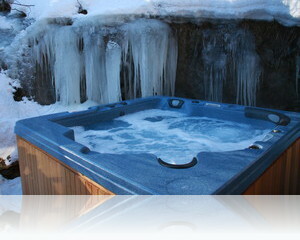 This area leads onto the external patio where the hot tub with breathtaking views of the mountains is waiting for you. The lounge complete with under-floor hearing is warm and cosy in winter yet cool and refreshing in summer, making it perfect for indoor seasonal get-togethers as well as those fun summer nights barbequing on the deck! The open plan kitchen has all modern facilities which include: oven, hob and microwave together with dishwasher to save your hands. Excellently equipped with all cooking utensils, ample crockery, cutlery and cookware as well as plenty of work surfaces well appointed for preparation of meals. Enjoying mountain views with front facing windows, the well designed kitchen has the benefit of hygienic granite worktops with strip lighting over all work surfaces, making time in the kitchen a pleasure. Also has a Nespresso machine with complimentary selection of capsules , steamer, toaster, and under-floor heating. Next to the kitchen at the front of the chalet is the independent dining room, once again with wonderful views of the Mont Blanc area. This has a large beautiful Middle Eastern style oak table with comfortable chairs allowing eight people to dine in luxury. A bright and exhilarating setting for breakfast in the morning, yet a cosy and peaceful for dinner in the evening, the front facing dining room enjoys panoramic views of Mont Blanc and access to the front patio. 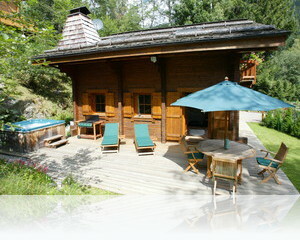 The chalet has four good-sized double bedrooms. Two bedrooms with their own balcony at the front of the house looking out onto the Mont Blanc area. Master Bedroom: stretching from the front to the back of the chalet with a large en-suite shower room, this wonderful cosy bedroom is full of character. Equipped with king-size bed, wardrobe, dressing table,lockers and reading lamps and sky-light windows for star gazing. It also has a flat screen TV with freeview. Bedroom 2: includes a balcony and is front facing with magnificent views of Mont Blanc Du Tacul, Aiguille de Midi and Le Dru. Equipped with a double, wardrobes, drawers, lockers, reading lamps and flat screen TV with Freeview. 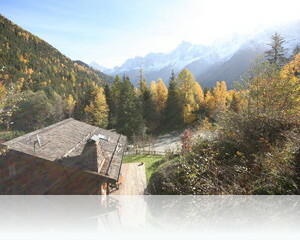 Bedroom 3: includes a balcony - is front facing with magnificent views of Mont Blanc Du Tacul, Aiguille de Midi and Le Dru. Equipped with 2 twin beds (can be joined), wardrobe, drawers, lockers and reading lamps. With a sky-light window for star gazing. Bedroom 4: to the rear of the chalet with a sky-light window for star gazing. Equipped with 2 twin beds (can be joined), wardrobe, drawers, lockers, and reading lamps. La Cachette has 1 large bathroom also with a shower and 2 large shower rooms all with basins and WCs serving the 4 bedrooms with one en suite to the master bedroom. All bathrooms are equipped with Molton Brown dispensers with luxury soap and hand cream! We have 2 large hot water tanks, which are heated overnight giving sufficient water for 8 people to have two showers daily. If our guests should wish to spend considerable time in the shower or to have baths, then it may be necessary to give the heater a boost when you return from skiing. 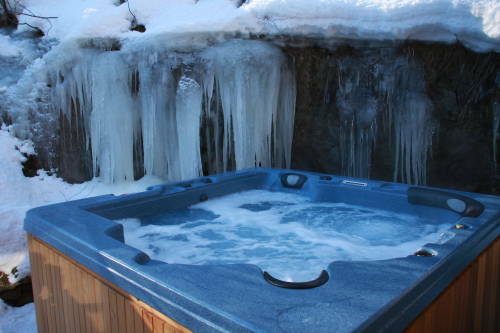 This luxury hot tub is a wonderful addition to the chalet. It is positioned on the patio outside the lounge and comfortably accommodates five people. 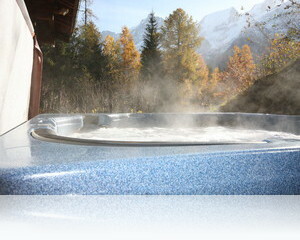 You will enjoy some of the most magnificent views in Chamonix whilst soaking away the aches of the day. 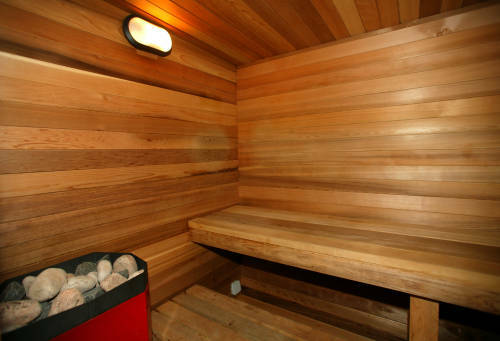 The lower floor has a beautiful cedar sauna, which comfortably accommodates six people. Relax and enjoy! The utility room houses a powerful washing machine and tumble dryer together with a backup freezer and fridge. Perfect for storing and drying ski boots and gear. This area includes storage space and plenty of shelves for your extra food supplies. There is ample parking opposite the chalet. Whilst the chalet is marketed as an self-catering many people also do take it catered. Our philosophy is a little different and when people do want catering we bring in a chef for the week to carry out breakfast and evening meals. This facility is not like any normal chalet dining, and offers a Gourmet menu together with most interesting cuisine. 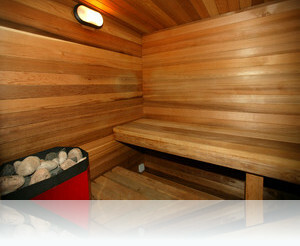 This experience can be taken either on a weekly basis or if preferred just for a couple of days. In addition to this we do offer a range of excellent quality French wines, which can be purchased from us at the Chalet. You will have a chance to sample some of these wines free of charge on your arrival. We can recommend transfer companies to and from Geneva, which has given us an excellent service over the years. We also have reliable ski guides and instructors, which we use year after year. For further information on any of these services please contact us and we can give you the individual information. Change Over Day for La Cachette is Saturday. Arrival after 4pm. Departure before 10am. Strictly Non Smoking Chalet but terraces and garden no problem. Well behaved animals are welcome by prior arrangement with Chamonix Chalets. La Cachette is a self-catering chalet however, catering can be organised where we would include a gourmet chef for the week. Reliable ski guides and instructors can be arranged for you in advance. Any questions the accommodation? Please contact us. Our Chamonix accommodation offers the perfect ski retreat in our luxury chalet.